Thanks to Helene Semanderes for posting a link this article on Facebook and bringing it to my attention. Giorgos Koutentakis could never have imagined that one day he’d be able to return to his family home. It was, after all, in complete ruins. The roof had collapsed into a pile of tiles and the walls had become home to dozens of crows. Like every other family in the village of Ethia on the Asterousia Mountains in Iraklio, Crete, his had left decades ago. Over the years, their houses started to crumble and the village population, which had once numbered in the hundreds, dwindled to single digits. You can’t count on signposts to find Ethia – there are none. The first traces of the village lie some 50 kilometers outside Iraklio, over a freshly tarred road leading from the hamlet of Rotasi. Ethia is one of Greece’s southernmost settlements and just above it, the hills overlook the Libyan Sea. Ethia is much like other villages strewn across the country. According to a survey conducted in 2011 by the National Technical University of Athens (NTUA), there are 6,356 villages around the country with populations ranging between one and 100 residents. NTUA professor Sofia Avgerinou-Kolonia, of the School of Architectural Engineering, explains how during the Turkish occupation, Christian settlements were gradually pushed toward the mountains. So Ethia was built largely by Cretans from Sfakia fleeing the Turks. 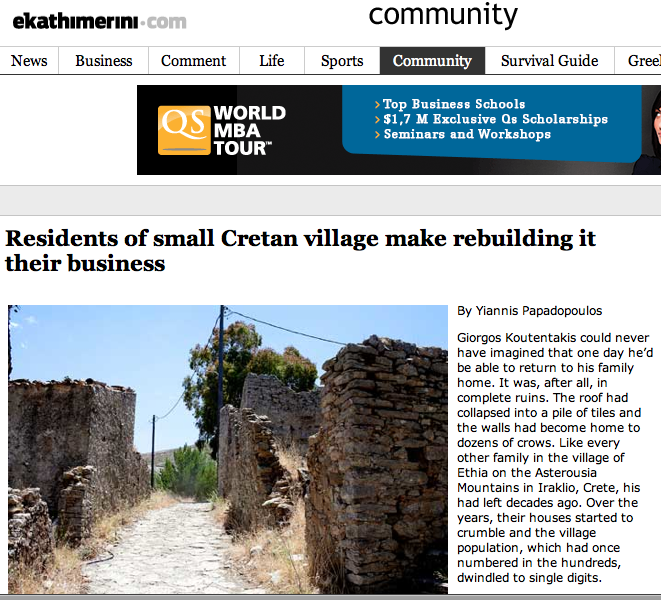 Later it became a refuge for families looking to hide away from the vicious cycle of Crete’s blood feuds. Following two world wars and successive waves of mass migration, the desertion of Greece’s highland settlements was completed with the exodus from rural communities to the country’s cities in the late 1950s and 60s. The same happened in Ethia, which from the mid-60s onward saw its residents gradually leave, relocating to get an education or work. It seems that the village did produce olive oil and sultanas at one point but it never appears to have had a secondary school. “Ethia had 300 residents, 70 of whom were children in elementary school. Their thirst for an education compelled their families to move,” Nikos Mathioudakis, who left the village when he was 13, tells Kathimerini. The residents scattered mainly to larger nearby villages and to Iraklio, while some went overseas. The few permanent residents that remain there today have framed photographs of relatives that now live abroad, mainly in Toronto.